Sixty-six random samples of fast food sandwiches, each about 200 g were randomly collected from Fayoum, Egypt. Eleven sandwiches of liver, burger, sausage, chicken shawarma, meat shawarma and chicken crepe were purchased from different shops and markets. Collected samples were subjected to chemical examination, determination of some heavy metals using Atomic Absorption Spectrophotometry (AAS) and aflatoxins using HPLC. 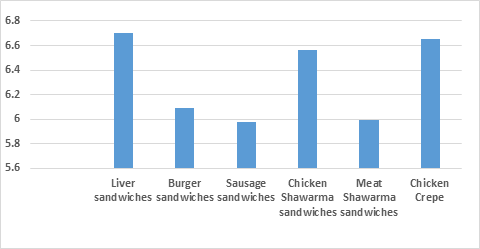 The highest mean value (6.70) of pH was recorded in liver sandwiches samples, while the highest mean values (55.886%, 42.516% and 4.371%) of moisture%, protein%, ash% were obtained from chicken crepe, meat shawarma and sausage sandwiches, respectively. The highest mean values (7.96, 7.81) of thiobarbituric acid (mg MDA/Kg) were recorded in liver and burger sandwiches, respectively. The highest concentration of lead was found in sausage sandwiches with a mean value of 1.06+ 0.35 mg/ g, while the highest concentration of aflatoxins concentration was got from burger sandwiches with a mean value of 7.75+ 2.58μg/ kg. Key words: Burger, Shawarma, Thiobarbituric acid, Heavy metals, Spectrophotometry, Aflatoxins. There is an increase in the consumption of fast food due to the change in social patterns which characterized by increased mobility, large numbers of itinerary workers and less family centered activities. So, good manufacturing practices, good sanitation or sanitary measure and proper food handling have been transferred from individuals/families to the food vendor who rarely enforces such practice (Majabadi,et al., 2016). Parameters such as thiobarbituric acid (TBA) test has been used for measuring oxidative rancidity in fat containing food. The TBA test is sensitive in determining the decomposition of products of highly unsaturated fatty acids (Akoh, 2017). Oxidative deterioration results in losing the quality of meat cuts-up as well as rancid odor and taste, which develop rapidly during refrigerated or frozen storage of meat cuts-up (Guillen-Sans and Guzman-Chozas, 1998) However, heavy metals from weathering, soils and industrial effluents made pollution sources (Saygideger and Dogan, 2005). Their toxicity, bioaccumulation and bio-magnifications in the food chain form a serious threat for human health (Peralta-Videa et al., 2009). The high levels of airborne traces metals (lead, Cadmium) are from contaminated fumes and effluents of local industries and traffic emissions (Shaheen et al., 2005). Over the past decades, the use of lead in manufacture of industrial products has led to widespread environmental pollution. (Watanabe, 1997 and Johnson,1998). Cadmium (Cd) is one of the high toxic heavy metals, it can be fetal in acute poisoning and may induce cancer in cases of chronic exposure (Burger and Gochfeld, 2000). On the other hand, the addition of copper sulfate (125 mg/ kg) to broiler chicken diet enhances weight gain, while iron (Fe) is supplemented to balance the ratio (Tazisong et al., 2005). The pollutants then came physiological toxic effect stored or incorporated in tissues (Mariam et al., 2004). So, the risk of contamination of soil, environment and crop pollution due to wastewater, fertilizers and contaminants is a serious concern because they cause mutations, neurotoxicity and cancer even at very low concentrations (Waalkes et al., 1999). Metal toxicity develop several diseases like cardiovascular, tubular dysfunction in kidneys and nervous disorders (WHO, 1996), so the toxicity of Pb is a consequence of the ability of Pb2+ to interfere with several enzymes (Ewers and Shlipkoter, 1991), also large variety of toxic effects, e.g. gastrointestinal, muscular, reproductive, neurological, behavioral and genetic malfunction (Johnson, 1998 &Tsuji and Karagatzides, 2001). The continuous consumption of sandwiches contaminated with these heavy metals exceeding the safe permissible limits may result in a public health hazards through progressive irreversible accumulation in human body (Mahmood and Malik, 2014). Many strains of mould affected meat especially Aspergillus flavus, Aspergillus parasiticus and Penicillium. That have been implicated as causative agents in "mycotoxicosis" because of the ability of their toxic strains in production of highly toxic chemical substances referred as mycotoxins, such as constitute potential cause tumors or inducing organ damage due to repeated ingestion of sub-acute levels of mycotoxins (Gimeno and Martins, 2006). Owing to continuous demand for fast foods in Egypt and large population consuming different types of them, it is necessary to safeguard consumers against health hazards as well as to ensure the sanitation condition under which they are produced. Therefore, this work was planned to secure the following topics: 1- Physicochemical examination of fast foods (pH value, Moisture %, protein %, Ash %, and Thiobarbituric acid value, TBA). 2- Determination the concentration levels of some trace elements (Pb, Cd & Fe) and Aflatoxins with emphasis on hygienic and toxicological aspects. 3- Suggestive control measures for improving the safety and quality of fast foods in Egypt. Sixty-six random samples of fast food sandwiches, each about 200 gm were randomly collected from Fayoum Governorate. Eleven sandwiches of liver, Burger, Sausage, Chicken Shawarma, Meat Shawarma and chicken crepe were purchased from different shops and markets. Collected samples were carried in an insulated ice box with a minimum of delay to be immediately examined in laboratory. pH value, Moisture content, protein content, ash content and thiobarbituric acid value (TBA). Moisture content, protein and ash content were determined according to (AOAC, 2000). Thiobarbituric acid (TBA) value was determined according to (Pearson, 1986). 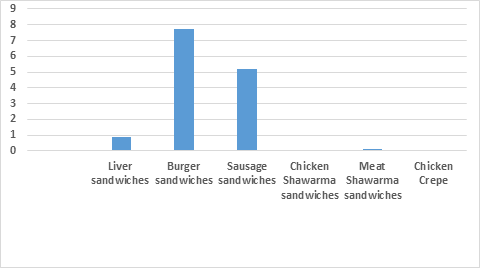 As shown in Fig (1,2,3 and 4), pH recorded highest mean value (6.70) in liver sandwiches, while the highest mean values (55.886%, 42.516% and 4.371%) of moisture %, protein %, ash % were obtained from chicken crepe, meat shawarma and sausage sandwiches samples respectively (Fig 1,2,3,4). The results of pH are in agreement with the result obtained by Abdelhai et al. (2015) they reported that the pH value of processed shawarma was 5.41. Meanwhile, the pH value of chicken shawarma sandwiches falls between 6.31 and 6.93. The differences in the pH values of the previous studied samples may be due to the difference in the ingredients which used in recipes during preparation of sandwiches. From the aforementioned data it could be noticed that most of the studied samples falls in the semi-neutral pH values. Meat with pH 5.6 to 6.0 is good for products, whereas good water binding is required (e.g. frankfurters, cooked ham), as well as meat with higher pH has a higher water binding capacity. Vasanthi et al. (2007) reported that the higher pH values may be attributed to fast heating rates during the cooking process which causes higher loss of free acidic groups. Cooking at high temperatures, show increase in hydrogen sulphide form corresponding to temperature increase. 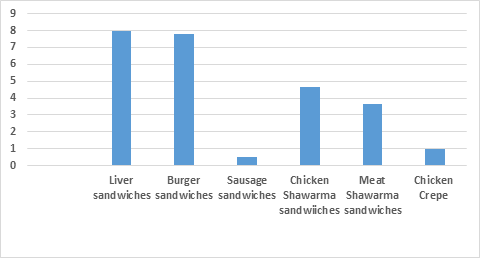 Fig (2) shows that the mean values of moisture content of liver sandwiches, chicken crepe, beef burger sandwiches, sausage sandwiches, chicken shawarma sandwiches and meat shawarma sandwiches samples were 47.900, 55.886, 41.660, 54.114, 52.787 and 48.080 %, respectively. This difference in the moisture content may be due to the differences in cooking procedures. It has been reported that water content can be decreased in the most of meat products according to processing (Abdelhai et al., 2015). Care must be taken in meat processing to protect the nutritional and organoleptic properties such as taste, smell, texture and appearance. However, Lawrie (1991) established that the range of moisture content in meat is 56-72%, while Paleari et al. (2003) reported that it was 70%. The nutritional value of meat is essentially related to the content of high-quality protein, that are characterized by the content of essential amino acids which cannot be synthesized by our body but must be supplied through our food. In this respect the food prepared from meat has an advantage over those of plant origin (Abdelhai et al., 2015). 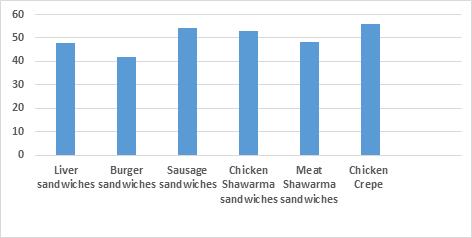 The data presented in Fig (3) indicated that both of meat and chicken shawarma sandwiches showed the highest protein content (42.516 and 35.25 % respectively) compared with the other samples which ranged between (21.906 to 27.723 %) The variation of protein content could be attributed to the type of meat and the additives used; these results as that obtained by Hassan ( 2005) and Abdelhai et al. (2015). 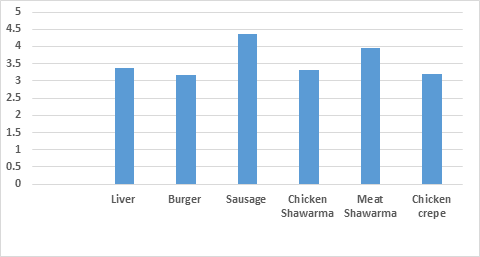 Fig (4) show the mean value of ash content in the sandwiches of liver, beef burger, sausage, chicken shawarma, meat shawarma and chicken crepe samples were 3.381, 3.951, 3.169, 4.371, 3.312 and 3.189 %, respectively. This difference in the ash content may be attributed to the ingredients used in product recipe. Hassan (2005) revealed a value of 0.96% ash in fresh beef, due to cooking method, cooking temperature as well as the amount of ingredients added. The highest mean values (7.96, 7.81) of thiobarbituric acid (mg MDA/Kg) were recorded in liver and burger sandwiches, respectively. (Fig. 5). Thiobarbituric acid (TBA) value was reported to be a good index for fat oxidation and the undesirable changes in the quality (Melton, 1983). TBA value (expressed as mg malonaldehyde / kg) of studied samples. The results shown in Fig (5) indicate that the liver sandwiches samples showed the highest TBA value (7.96 mg malonaldehyde / kg) followed by beef burger sandwiches samples (7.81 mg malonaldehyde / kg). Meanwhile the sausage sandwiches samples showed the lowest TBA value (0.52 mg malonaldehyde / kg) followed by chicken crepe samples (1.01 mg malonaldehyde / kg). But both of meat and chicken shawarma sandwiches samples showed moderately TBA values 3.67 and 4.63 mg malonaldehyde / kg respectively. Wu et al. (1991) reported that when the TBA value is higher than 1 mg MA/kg off-odors could be appeared and that lipid oxidation indication. By the lightening of this result, sausage sandwiches couldn’t be considered as rancid since the TBA values were lower than 1 mg MA/kg. On the other hand, sandwiches of liver, beef burger, meat shawarma, chicken shawarma and chicken crepe could be considered as rancid. The highest TBA values could be attributed by cooking that break lipoprotein complex and lipid fraction resulted in which released and resist oxidation (Dawson and Gartner, 1983). TBA values decreased with increasing pH to a minimum at pH 7.0 but then increased at pH 9.0 (Tichivangana and Morrissey, 1985). Table (1): Heavy metals concentrations in the examined fast food samples (mg/g). Recent studies have focused attention on chemical hazard in food including high limit concentration of heavy metals and aflatoxins because of their association to harmful effect in human bodies and lead to death, the concentration of iron was found with a mean of 0.046, 0.10, 0.0046, 11.39, 24.59 and 0.05, while the lead was found with a mean of 0.271, 0.94, 1.06, 0.65, 0.62 and 0.24 mg/g. However, the mean concentration of cadmium was found 0.0013, 0.0046, 0.0073, 0.013, 0.010 and 0.0016 mg/g in the examined sandwiches of liver, Burger, sausage, chicken shawarma, meat Shawarma and chicken crepe, respectively Table (1). The obtained Cd values are exceeded than the threshold value of the EC and FAO (1983), (0.1 mg /kg). However, FAO (1983) recognized (3-15 mg) as critical limit for acute Cd toxicity, otherwise toxic symptoms will be occurred within ingestion of 10- 326 mg. With regards to lead in the liver, burger, sausage, chicken shawarma, meat shawarma and chicken crepe samples, it exceeds than the permissible levels; 0.4 mg/kg as limited by EC (2001). However, the acute concentration of Lead causes renal failure and liver damage as reported by (Luckey and Venugopal, 1977). The recommended daily allowance of lead is 0.3 mg /day (Institute of Medicine, 2003). Corresponding to iron content in all studied samples, it laid in the permissible limit as found by Demirbas (1999). However, the high tolerable intake for (0 months–8 years age) and adults (14–70 years) is 40 and 45 mg /d, respectively. The mean concentration of aflatoxins (AFB1, AFB2, AFG1& AFG2) were found 0.91, 7.75, 5.17, 0.06 and 0.11 μg/kg in the examined sandwiches of liver, burger, sausage, chicken shawarma and meat shawarma, respectively. The aflatoxins could not be detected in all chicken crepe samples Fig (6). The obtained results were lower than those obtained by Aziz and Youssef (1991) who reported Aflatoxins was 7 μg/ kg in sausage; while the results were nearly similar to Hamed et al (1994). The permissible limit according to WHO is “15 ppm" (Jelinek et al., 1989). Regarding human food products, the European Community and many other countries have imposed 2ng/g AFB1 as maximum tolerance level (FAO, 2004). Human exposure to mycotoxins depends on the consumption of mold contaminated food (Wafia and Hassan, 2002). FDA (1999) reported that, aflatoxins, especially B1, B2 and G1, are the most commonly found in human foods, and their health effects include acute toxicity and lack of mental development. Meat establishment develop and implement a system of preventive control designed to improve the safety of their products that known as HACCP. This study suggested that regular survey of TBA value (index for fat oxidation), aflatoxins and heavy metals should be done to evaluate food chain contamination aiming to create data to permit a detailed health risk assessment to fast food consumers. Additionally, in fast food industry all the potential indoor sources of fungal dissemination must be monitored, aiming to assess and prevent fungal and, consequently, mycotoxins contamination. Abdelhai, M.H., Sulieman, A.M.E. and Babiker, E.R.B. (2015). Some Chemical and Microbiological Characteristics of Shawerma Meat Product. J Food Nutr Disor 4:2. AOAC "Association of Official Agricultural Chemists" (2000). Official Methods of analysis of the association of official analytical chemists, 17th ed. Association of Official Analytical Chemists, Washington, D. C.
Dawson, L.E. and Gartner, R. (1983). Lipid oxidation in mechanically deboned poultry. Food Technology, 37, 112-116. EC (2001). Commission Regulation No. 466/2001 of 8 March 2001, Official Journal of European Communities 1.77/1. Ewers, U. and Shlipkoter, H. (1991). Lead in Marian E (ed.) metals and their compounds in the environment. VCH, Weinheim. FAO (2004). Worldwide regulations for mycotoxins in food and feed in 2003. FAO Food and Nutrition Paper 81. Food and Agriculture Organization, U.N. Rome, pp. 48-126. 2004. Food and Drug Administration, FDA (1999). Action levels for poisonous or deleterious substances in human food and animal feed. Download from: http: /Vm. Cfsan.fdagov./ird/fdaact. Hamed, M.L., Hussein, M.A., El-Kotry, R.A., Doma, M.B. and El-Shawaf, A.M. (1994). Bacterial fungal contamination of processed sausages: Aflatoxin production by certain fungal isolates and the effect of chemical preservatives on fungal growth in the processed products. J. Agric. Sci. Mansoura Univ. 19, 2001-2015. Hassan, S.R.T. (2005). Effect of Feedlot Regimen on Performance and Carcass Characteristic of Sudan Baggara Cattle. MSc. Thesis Faculty of Animal Production, University of Khartoum. Institute of Medicine (2003). Dietary reference intakes: applications in dietary planning. Subcommittee on interpretation and uses of dietary reference intakes and the standing committee on the scientific evaluation of dietary reference intakes. Institute of Medicine of the National Academies, The National Academies Press, Washington, DC, p. 248. Jelinek, C.F., Pholand, A.E. and Wood, G.E. (1989). Worldwide occurrence of mycotoxin in foods. An update. J. AOAC. 72; 223-230. Lima Dos Santos, C., James, D. and Teutscher, F. (1981). Guidelines for chilled fish storage experiments. FAO Fish Tech. Pap. P. 210. Luckey, T.D. and Venugopal, B. (1977). Metal Toxicity in Mammals. Plenum Press, New York. Mariam, I.S., Iqbal, and Nagre, S. (2004). Distribution of some trace and macro minerals in beef, mutton and poultry. Inter. J. of Agric. and Biolo.6: 816-820. Melton, S. I. (1983). Methodology for following lipid oxidation in muscle foods. Food Technol., 37 (7):1105-1116. Pearson, D. (1986). Indices de aceites y enranciamiento. In Tecnicas de Laboratorio para el analysis de alimentos. p. 132- 143. Acribia, Zaragoza, Spain. Radu-Rusu C.G., Pop I.M., Albu Aida, Bologa Maria and Radu-Rusu R.M. (2013). Transferability of certain heavy metals from hens feed to table eggs laid within different rearing systems, Scientific Papers, USAMVIasi, Faculty of Animal Breeding, 59, 218-222. Saygideger, S. and Dogan, M. (2005). Variation of lead, cadmium, copper and zinc in aquatic macrophytes from the Sayhan river, Adana, Turkey. Bull. Envi. Contam. Toxicoi., 74: 545-551. Tichivangana, J. Z. and Morrissey, P.A. (1985). The Influence of pH on Lipid Oxidation in Cooked Meats from Several Species. Irish Journal of Food Science and Technology. Vol. 9(2): 99-106. Waalkes, M., Anver, M. and Diwan, B. (1999). Chronic toxic and carcinogenic effects of oral cadmium in the nobel (NBL/Cr) rat: Induction of neoplstic and proliferative lesions of the adrenal, kidney, prostate and tests. J. Toxical. Envir. Heaith, 29: 199-214. Wafia, H.A. and Hassan, A.A. (2002). Santiary status of some ready to eat meat meals in Cairo and Giza Governorate. J. Egypt. Vet. Med, Assoc., 60, 95-104.
WHO, World Health Organization (1996). Essential safety requirements for street-vended foods (revised Edition). Wu, W.H., Rule, D.C., Busboom, J.R., Field, R.A. and Ray, B. (1991). An intermediate moisture product from mackerel (Rastrelliger kanagurta) using salt curing, fermentation and drying. J. Aquat. Food Prod. Technol.